This news comes six months after the company – which specializes in solutions to manage and accelerate the transition to electric vehicles – was acquired by Geotab. “This expansion into Catalyst137 allows us to co-locate with other globally-focused IoT firms and provides significant space for our growth plans,” said Matt Stevens, Geotab’s VP of Electric Vehicles and CEO of FleetCarma. Catalyst137 is a key asset in Waterloo’s industry support ecosystem, which we’ve highlighted in a downloadable feature sheet.” A massive, 475,000-square-foot facility, it caters to Internet-of-Things companies and is home to a testing facility, commercialization services, a hackable streetscape and established companies like Miovision and BorgWarner. In his comments, Stevens specifically noted Waterloo’s talent advantage as a reason FleetCarma is choosing to expand within the community. “Embedded in Geotab’s acquisition of FleetCarma was an understanding of the immense talent and innovative culture that is present in Kitchener-Waterloo,” he said. Read more of the story from the Waterloo Region Record here. 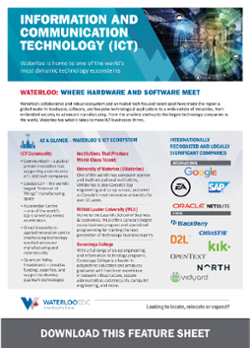 Want to know more about Waterloo’s tech community? Download our industry feature sheet now!